Dek Nong is a Sumatran orangutan who entered quarantine in September 2007. 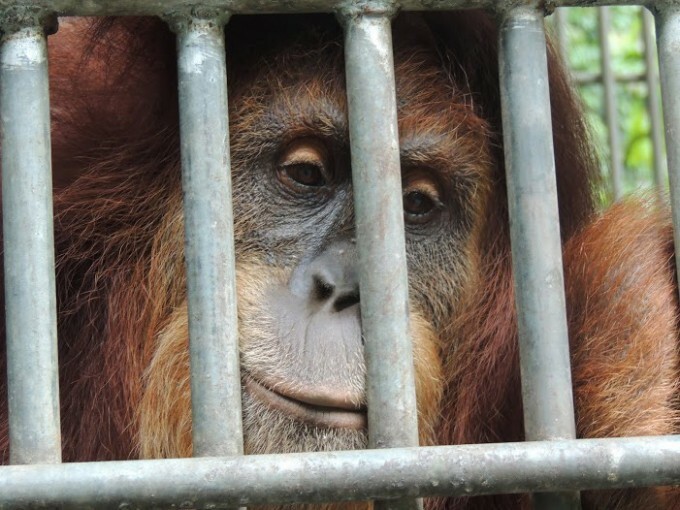 She was released to the forest in Jambi shortly after February 2008 and was making good progress until the end of 2008, when she was discovered to be suffering a form of creeping paralysis, resulting in the loss of full use of her arms and legs. As a result she returned to the SOCP quarantine center in February 2009 for examination and treatment. She also displays a slight deformity in her left wrist (it is bent acutely and swollen). Physical examinations suggest an arthritic condition, but biopsies, further tests, and examination by local and visiting veterinarians, as well as a Swiss "human" trauma surgeon, have so far failed to diagnose Dek Nong's condition satisfactorily. Dek Nong is developing into a beautiful female orangutan. She has a very sweet personality and is very patient with the keepers. The keepers love spending time with Dek Nong, as she will often be very gentle when it comes to feed time. Her favorite food is melon and will prioritize this when she gets fed. At the quarantine center, all orangutans get fed 6 times per day. This is standard as most wild orangutans are frequently feeding and resting. Dek Nong unfortunately does not move much. Her creeping paralysis inhibits her from being able to move around a lot. The staff takes special care and attention to ensure her home is easy for her to move around in and is still enriching. We also take special care to ensure she has a comfortable nest to sleep in each night. The leaf material is always prioritized for Dek Nong. Dek Nong's problem solving skills are quite adept. She is a very smart female, who loves to engage in new enrichment devices. It does not take her long to work out how to access food from toys. The keepers are always coming up with new and novel ideas to keep her mentally enriched.